Ironmaking in the rotary hearth furnace (RHF) is a direct reduction process which utilizes non-coking coal for the reduction of iron ore. The RHF is the process reactor which consists of a flat, refractory hearth rotating inside a stationary, circular tunnel kiln. Inside the RHF, direct reduction of iron ore or iron-bearing waste materials occurs, using coal as the reductant. RHF is not a new technology. It has been used successfully in a range of industrial applications which includes heat treatment, calcination of petroleum coke, waste treatment, and non-ferrous high-temperature metal recovery. The history of ironmaking in RHF goes back to the mid-1960s with the development of the ‘Heat Fast’ process by Midrex. Since then several ironmaking processes based on RHF have been developed. These include ‘Fastmet’ process/‘Fastmelt’ process, and ITmk3 process which were brought into commercial operation. These processes have been described in separate articles having links http://ispatguru.com/fastmet-and-fastmelt-processes-of-ironmaking/, and http://ispatguru.com/itmk-3-process-of-making-iron-nuggets/. Other RHF processes are ‘Redsmelt’ process, ‘Inmetco’ process, ‘Iron Dynamics’ process, ‘DRyIron’ process, ‘Comet’ and ‘SidComet’ processes and Hi-QIP process. The Redsmelt process technology has been developed to meet the growing demand for a low cost environmental friendly ironmaking alternative to the traditional blast furnace route. The plant with this process can be designed for a production capacity of 0.3 million tons per year to 1.0 million tons per year of hot metal. The process can treat a wide range of iron ore fines and waste materials from the steel plant. The Redsmelt process is based upon a RHF which reduces green pellets made out of iron ore, reductant fines and binders to produce hot, metallized direct reduced iron (DRI) which is charged to a submerged arc furnace (SAF). The process operates at high temperature and atmospheric pressure. The iron oxide feed to a Redsmelt furnace is in the form of green pellets made of fine iron ore, reductant and binders. Binders are to give to the green pellets sufficient mechanical strength to support the handling shocks downstream. Pellets are screened on a roller-type screen to a size between 8 mm to 16 mm. Under and oversize materials are recirculated to feed the pelletizing disks. Pellets are then distributed onto the RHF in a layer up to 30 kg/sqm. While traveling through the furnace in 12 minutes to 18 minutes, pellets are heated up to 1370 deg C. Drying of the pellets, coal devolatilization and iron oxide reduction takes place during the heating process. The intimate contact between iron oxide and carbon at a very high temperature results in a very fast reaction rate. To prevent reoxidation of metallized iron the final zones of the furnace are operated in sub-stoichiometric atmosphere. The hot DRI product is then fed to the SAF for smelting into hot metal and slag. The process flow sheet is shown schematically in Fig 1. The process was developed by the International Nickel Corporation (INCO), Canada in 1978. INCO developed this process and named it ‘Inmetco’ (Inco + met) since it was developed for the recycling of the metallurgical waste. The process can also be used to reduce the iron ore fines and combination of iron ore fines and the metallurgical waste materials. The Inmetco process is based upon a RHF which reduces briquettes made out of iron ore fines, waste iron bearing materials and pulverized coal to produce hot, metallized DRI which can be directly charged into an induction furnace or electric arc furnace. The process operates at high temperature and at a slightly negative pressure. The iron feed to an Inmetco furnace is in the form of disk pellets made of fine iron ore under 250 micro meters in size and fine coal or coke or char with less than 25 % volatile matter. They are distributed onto the RHF in a layer which is around 3 pellets deep by means of a pivoting belt conveyor. The process uses a quick acting binder which allows the pellets to be transported to the hearth without significant degradation. The hearth rotates continuously and the pellets are heated by burners located around the periphery of the hearth to 1250 deg C to 1300 deg C during a period of 10 minutes to 15 minutes. The burners are arranged in groups, and form heating and reduction zones. The heating zone makes around one third of the hearth area and the reduction zone around two third of the hearth. The burners are located on the inner and outer circumference. The hot DRI product can either be collected in N2 purged transfer cans, or directly fed to the electric furnace for melting. The RHF operates under a slight negative pressure, and sealed by a water seal trough. The process flow sheet is shown schematically in Fig 2. The Iron Dynamics ironmaking (IDI) process is based upon a RHF which reduces a carbonaceous iron oxide charge to metallic iron solids which are charged to a SAF to complete the reduction and to melt and desulphurize the reduced iron. Melting the DRI also allows for a phase separation of the resulting liquid slag and iron. The IDI process is composed of five process areas namely (i) raw material receiving, (ii) ore and reductant (coal) grinding and preparation, (iii) pelletizing, (iv) rotary hearth reduction, and (v) SAF smelting. After the ore is received, it is dried to the moisture content less than 0.5 % using off gas from the RHF. Ore is also beneficiated using magnetic separators and screens to reduce the amount of gangue materials. It is then ground to 50 % minus 200 mesh size. Coal is conveyed to coal/flux stone pulverizers for sizing to 80 % minus 200 mesh size. Ground ore and coal are intensively mixed with binders and water in a mixer and fed onto disc pelletizers. Wet pellets are dried to less than 1 % moisture and preheated to 150 deg C in a circular grate dryer. The pellet charger receives the dried green balls and layers them onto the furnace hearth in 25 mm to 40 mm thick layers. The natural gas fired RHF has eight reaction zones. Temperature, gas flow and gas composition are controlled to provide the required conditions in each zone to properly heat, reduce and protect the pellets. 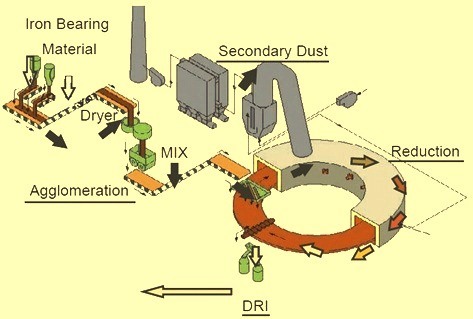 The DRI at the discharge of the furnace has around 85 % metallization. An additive facility introduces flux, coke, silica or other materials to the DRI transport ladles to control slag chemistry in the SAF. The exhaust gas system removes heat, dust, sulphur dioxide and nitrous oxide from the flue gas. An afterburner carries out the combustion of any remaining CO (carbon monoxide) in the exhaust gas water-cooled duct. The gas is cooled and the NOx removed in the primary cooler. Exhaust gas is used to preheat combustion air and supply heat to the ore, coal and pellet dryers. After the pellet dryer, the gas is filtered and SOx (sulphur oxides) removed prior to discharge from the stack. The DRI and the additives fall into the slag layer of the SAF by gravity where smelting takes place. Average metallization here is about 95.8 %. Slag is tapped from the furnace into slag pots and transferred to a slag processing facility. The process flow sheet is shown schematically in Fig 3. The DRyIron process was developed by Maumee Research and Engineering Inc. (MR&E). The process is based upon a RHF which reduces green pellets made out of waste iron oxide materials and pulverized non metallurgical coal to produce hot, metallized DRI (greater than 90 %). The process operates at high temperature and atmospheric pressure, features a short residence time and can also be used to recycle waste iron bearing materials. The iron oxide feed to a DRyIron furnace is in the form of green pellets/briquettes made of fine iron oxides and coal or coke which eliminates the pre-drying of the pellets. Under ideal high-temperature (around 1300 deg C) theoretical conditions, iron oxide reacts with fixed carbon to form metallic iron in the briquette with the release of CO2. The theoretical ratio of fixed carbon to iron oxide is 1.5:1. DRyIron process has been formulated to produce metallic iron using a carbon-to-oxide ratio of 6:1, which results in the evolution of both CO and CO2 and leaves a residual carbon level of around 4 %. The key to this process is controlling the CO to CO2 ratio to minimize reoxidation, carbon consumption and furnace residence time. While traveling throughout the furnace, pellets are heated up to 1300 deg C. Drying of the pellets, coal devolatilization and iron oxide reduction takes place during the heating process. The intimate contact between iron oxide and carbon at a very high temperature results in a very fast reaction rate. The hot DRI product can then be supplied to the steel melting shop by a number of different options. The process flow sheet is shown schematically in Fig 4. 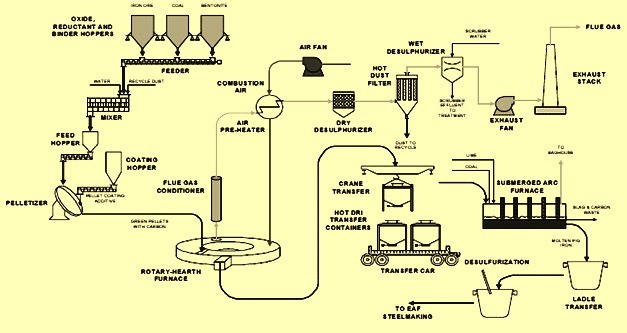 The Comet process, developed by the Centre de Recherches Metallurgiques (CRM), Belgium is a coal-based system that produces sponge iron from ore fines and limestone in a rotary hearth furnace. The Comet direct reduction process produces low gangue and low sulphur DRI from iron ore and coal fines. Extended series of laboratory tests have demonstrated the feasibility and the flexibility of the process, which can notably be operated with any kind of coal, or other solid reductant (including lignite and coke breeze) and which is also very well suited for recycling iron-bearing metallurgical wastes to be substituted to (or mixed with) the iron ore. A laboratory, 100 kg/hour installation was brought on-stream in November 1996. Based on the successful results obtained, a pilot 1.5 ton/hour plant has been built at Sidmar, Ghent, Belgium. Metallization results confirm those obtained from the laboratory unit. Productivity, cost, price, energy consumption and environmental impact have been established. In Comet process, the iron-ore and coal fines are not mixed and pelletized unlike the other processes mentioned before. Instead, they are charged in the form of alternate layers on the hearth. Limestone is usually added in order to control the sulphur in the coal. The temperature in the reduction zone is around 1300 deg C. Natural gas, coke oven gas, and pulverized coal etc. are fired to generate the heat. Post-combustion of the volatiles and CO released during the reaction also provide some amount heat. The DRI layers undergo sintering due to the high temperature. However, the excess char remains powdery and can therefore, be easily separated using a screen. The exhaust gas undergoes further post-combustion outside the furnace and the heat is utilized to heat up the process air and the charge materials. Because of the higher load on the hearth in this process, the processing time in this process is usually much larger than its counterparts which use composite pellets. 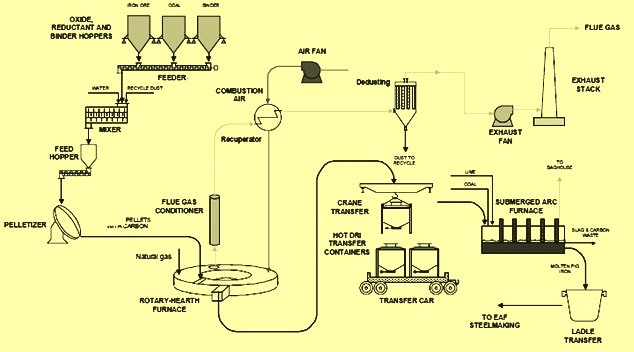 The process flow sheet is shown schematically in Fig 5. The SidComet process is similar to the Comet process. The only difference is that the iron-ore and coal fines are fed as a mixture in this case. The residence time is similar to the Comet process. Due to the higher residence time, the productivity of this process usually remains lower than the pellet based processes. 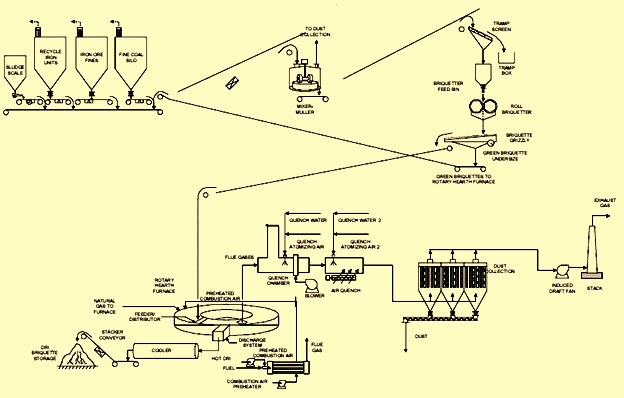 Based on the concepts namely (i) the process does not require natural gas or coking coal as a reducing agent, (ii) the iron product of the process is free of gangue components, (iii) the equipments are as simple as possible, and (iv) the energy recovery system is minimal, and experimental results, a new ironmaking process called the Hi-QIP (High-Quality Iron Pebble) process was developed. The process is a new coal-based process to produce high quality iron. The process is similar to ITmk3 process since it enables the melting of reduced iron in the rotary hearth furnace. The process permits fluctuation of mixing of raw material. Development has currently reached the pilot plant stage. The Hi-QIP process has two distinctive features in comparison with similar processes. These are (i) the use of a layer of carbonaceous material on the rotary hearth, and (ii) melting of reduced iron in the furnace. 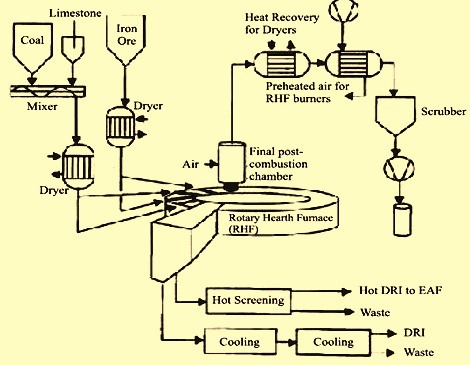 The main reactor in the Hi-QIP process is the rotary hearth furnace. Coarse grained or fine grained iron ore, coal and limestone are used as raw materials. Use of lumpy materials is not considered for the process. A carbonaceous material, such as coal, is laid on the hearth, and small cup-shaped hollows are formed in this layer by a roller. Iron ore is used as the iron source, coal as the reducing agent, and limestone as a flux agent. These materials are mixed and charged onto the bed of carbonaceous material, and are then heated by burners. In this process, the iron ore is reduced and melted, and the coal mixed in the raw material layer is gasified and acts as a reducing agent. The limestone melts and forms slag with the gangue and ash components in the mixture. The molten iron and molten slag flow into the hollows, where they are solidified by the chiller, forming pebbles. The iron pebbles and slag pebbles are discharged from the furnace by a screw device. 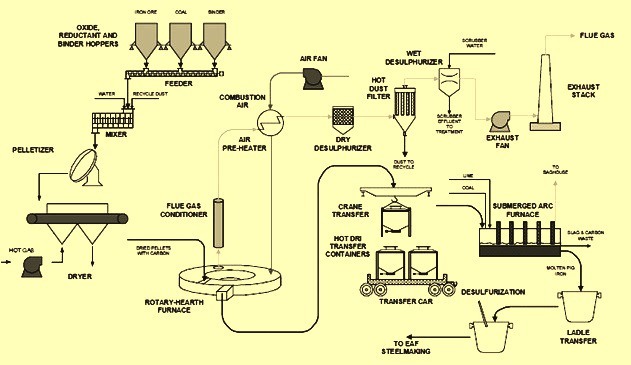 The general process flow during the ironmaking by the RHF is given in Fig 6. The reduction of iron ore/coal agglomerates in a RHF is a coke-free, environmentally friendly ironmaking process. However, the productivity and energy efficiency of the process is low due to shallow bed height, low reaction temperatures, and insufficient carbonaceous additives in the pellets. The kinetics of reduction of iron oxide in iron ore/coal agglomerates is highly temperature sensitive since it involves strongly endothermic reactions. On the other hand, a higher temperature promotes the reoxidation of newly produced DRI by CO2 and/or O2. In current RHF practice, the bed depth of agglomerates is shallow, only 2-3 pellets high, and the solid reductant is low in volatile matter. Therefore, the flow of gases which can protect the pellets from reoxidation is weak and unsteady. The practice of maintaining the CO/CO2 ratio greater than 2 results in very poor fuel efficiency while the low process temperature limits the productivity of the process. The successful use of RHF technology for the direct reduction of iron-bearing materials depends upon the way the process technology is applied through proper process engineering. If the RHF is correctly integrated into the global process and direct reduction technology is applied correctly, the result is an energy efficient, environmentally friendly, economic system for producing quality alternative iron. The coal-based direct reduction concept utilizing the RHF is a simple one. However, commercial implementation of the concept has not been easily achieved. The process concept for ironmaking in RHF and comparison of single layer charging with multi-layer charging is shown in Fig 7. The following reactions take place during ironmaking in RHF. There are three to four major zones inside the RHF namely (i) preheating zone (b) main reduction zone (c) final reduction zone and (d) cooling zone. The furnace atmosphere is controlled to meet the thermal and metallurgical requirements of the process with proper control of the fuel and oxygen ratio. Higher oxygen potential is required in the preheating zone in order to extract the maximum chemical energy stored in the fuel which is combusted in this zone. Elimination of entrapped moisture and the volatile matters also take place in this zone. The two reduction zones have a much lower oxygen potential which prevents the re-oxidation of reduced pellets. In reduction zones, the iron-oxide and some other impurity metal oxides are reduced to their metallic forms. In the cooling zone the DRI is cooled below 300 deg C before discharging. Apart from the burning fuel, there are other sources of heat inside the RHF. The post combustion of CO gas generated during reduction helps to reduce the energy requirement of the process. Sometimes, secondary air is also injected to facilitate the post combustion of the exhaust gases. Combustion of volatile matters also releases some heat. Some minor amount of heat is also generated during combustion of carbon present in the pellets/briquettes. Non coking coal and sometimes low grade carbonaceous materials including waste plastic can be used in the RHF as reductant. The utilization of these low grade carbonaceous reductants enable the RHF process to produce metallic iron by the reducing the iron oxide. However, percentage of volatile matter content in the carbonaceous reductant is very critical for its use in RHF. The rapid evolution of gas increases the internal pressure which can result into the break-down of pellets/briquettes. This can be avoided to keep high percentage of lumps in the product DRI. The speed of hearth rotation is required to be externally controlled. The speed depends on the reactivity of the raw materials. The normal practice is to ensure a residence time long enough for the pellets / briquettes to attain a high degree of metallization. The RHF is normally operated at a small negative pressure in order to avoid the leakage of furnace gas to the external environment and is sealed using water seal troughs. It is generally advantageous to utilize the sensible heat of hot DRI by hot-charging into a smelter. In the event of delayed smelting, the usual practice is to convert the DRI into hot briquetted iron (HBI) to minimize the degree of re-oxidation by reducing the available surface area. Heat transfer to the lower layers is one of the serious drawbacks of the RHF, especially when multilayer pellet bed is used instead of single layer to improve the productivity. The shrinkage of composite pellets / briquettes is expected to facilitate the transfer of heat from top layer to the bottom. Shrinkage of the pellets/ briquettes occurs because of combined effect of chemical reactions and sintering of the iron oxides. This enhances the reaction kinetics of the lower layers. It depends upon both the temperature and time. Some studies on shrinkage phenomena reveals that wood charcoal composite pellets / briquettes have better shrinkage behaviour than that of the bituminous coal char and graphite composite pellets / briquettes. The exhaust gas from the RHF normally undergoes complete post-combustion by utilizing additional air. The energy obtained from this is used namely (i) to preheat combustion air, (ii) dry the feed materials, or (iii) generate steam in waste heat recovery boilers. Dust of the exhaust gases is collected in bag filters. This dust contains high percentage of volatile metals like zinc and cadmium mainly because of the recycling of the waste materials.